The diplomats sent abroad by the U.S. Government to man embassies and consulates identify these facilities with the Stars and Stripes. The diplomats themselves had no distinctive flags until the 20th century. In the early days of the republic it was traditional for small boats of the U.S. Navy to display a jack in the bow of any small boat carrying a United States Counsel. In 1910 this tradition was codified by the U.S. Department of State when it authorized a white capital “C” to be inserted into a circle of 13 white 5 point stars. This was to recall the supposed first jack used by diplomatic personnel. In the 1920s the Department of State started to use the arms of the United States on its flags, reminiscent perhaps of the fact the Secretary of state is the keeper of the U.S. Great Seal. Today, courteously, the flag of an accredited U.S. Ambassador is the U.S. arms on a white disc encircled by 13 white stars, while the Secretary of State utilizes the same device with only four stars, one in each corner. 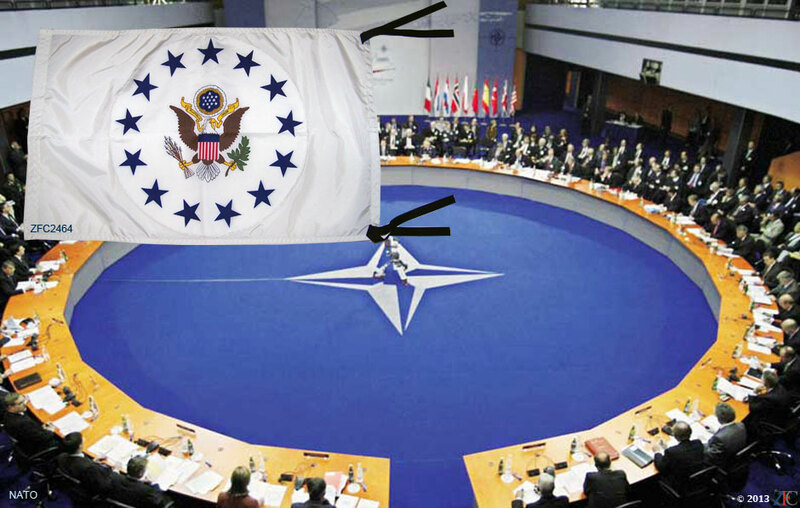 Ambassadors accredited to organizations display the reverse, a white flag with the arms encircled by 13 blue stars.